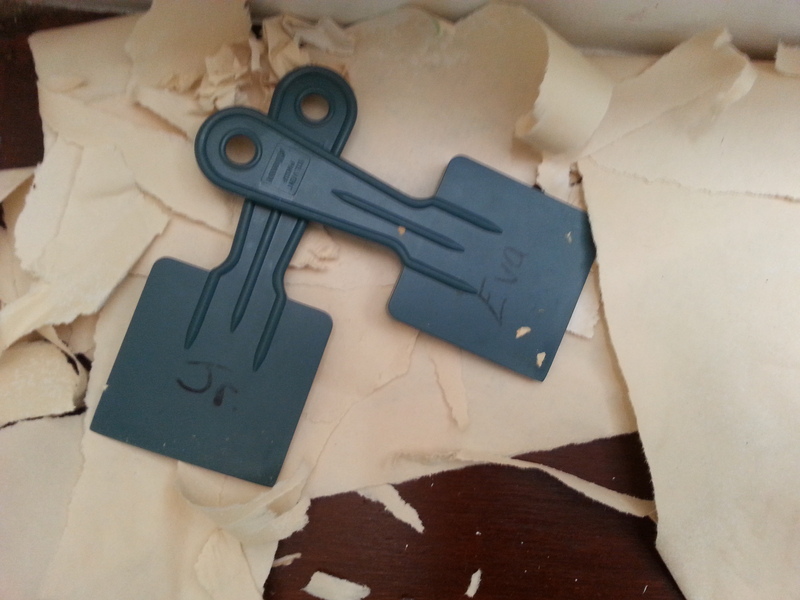 Remodeling House and Heart | Small moments. Revolutionary insights. Finding hope amidst the mundane. ~ Small moments. Revolutionary insights. Finding hope amidst the mundane. I Didn’t Go To Church For 3 Months. This Is What I Learned. Its Sunday morning. I am sitting in the place where Americans gather to laugh and love and converse about life, the place where lives are encouraged and transformed for the better, the place that has come to be one of my favorite symbols of comfort and rejuvenation. Yes, it is a beautiful bustling day at my local Starbucks. You walk in, you pick your version of hope in a cup, you walk out feeling a little bit wiser and just a little bit more prepared to handle the troubles of the day. Isn’t that what Sunday mornings are for- grabbing a little hope in a cup to take with you for the rest of the week? I didn’t go to church for nearly 3 months. That might not be shocking to some, but for me that is a huge statement. I have spent most of my post-college, adult life highly involved in everything church related. However, this past winter due to some uncontrollable circumstances combined with transitional timing and life in general, church was not a place in which I could be found. After a few weeks I became aware of my absence and I began to take note of some changes that were going on in my spiritual life. I started questioning why, as Christians, we go to church. I started questioning why I go to church. What is church anyways? I know the answers I have been given from a life time of sermons, catechism classes, and Sunday School teachings but I needed to discover the answers for myself. 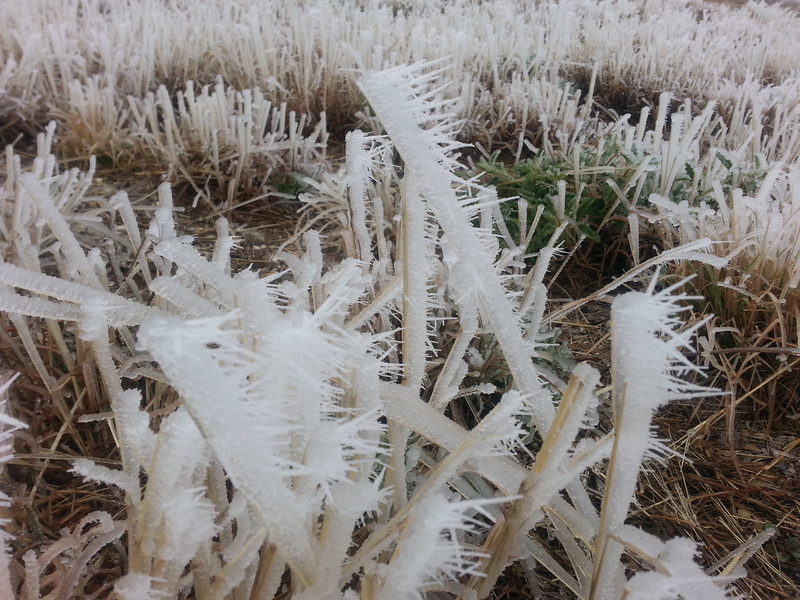 So I decided to talk to God about it as I trekked through an unusual winter sans church. These were my findings. Church can exist outside of the a building. Now I know that wherever 2 or more are gathered in His name then Jesus is present but during my dry spell from church I actually experienced a completely different idea of what church could be. It was so simple and reminded of how Jesus would often meet with people throughout the bible. It was all about the food. Friends, family members, and people we had just met would gather around our dining room table during the winter of no church and we would commence in some pretty spectacular discussions on faith, the bible, and pretty much everything you could think of that we experience on a daily basis. You know…. Life. I remember one particular evening sitting at the table after a big enchilada and Spanish rice dinner with some guests and thinking to myself that the dinner conversation was one of the most spiritually stimulating discussions that I had participated in for a long time. The conversation was honest. I wished that I could have this all the time. Wouldn’t it be great if this was how church happened always? But of course, that is exactly how church began. Jesus didn’t always sit in a building and wait for people to come to him. He went to people’s houses and shared meals with them. Even after Jesus had left this earth, His disciples would gather together in their homes and just talk. They would share about what Jesus had done in their lives and how they experienced Jesus in their personal lives. 2. You can still have a fruitful growth/ healthy walk with Christ without going to the physical building of a church. 3. Without the distractions of church your eyes are opened to be able to see the world around you and the people that God loves who aren’t going to church. What am I going to wear? What am I going to make for the church potluck? What is going to be my lesson for Sunday school class? These were just a few of the questions that would fill my brain in previous seasons of churchgoing. Notice that God is not actually a part of any of those questions. But I was serving. Right? Serving has always been one of my arguments as to the necessity of church. We need to be serving others and church always needs volunteers. This is true. But you know who else needs volunteers? THE WORLD. The winter church- solitude brought with it acquaintances with non-church goers. Real people with very little to non-existent faith in a God who can bring peace to your life. People with real problems, addictions, and pain. People that churches had turned away in one way or another. People who did not feel comfortable going to church because the church goers would ask you to take off your hat or to cover up your tattoos or to pretty much change your entire self before you come to the altar. People who Jesus said to love and to win over with said love. I guess, you could count all those months without a steeple as research as to why people do not go to church. Plain and simple: the church can be a very judgmental and daunting place sometimes especially to someone who is not accustomed to the culture of church. When I wasn’t busy with churchy activities I really began to observe how there is this group-think mentality that is plaguing our churches. It is this nebulous bubble that, if you are not careful, you can find yourself trapped in. I really never noticed it before and I really didn’t even know that I was a part of it, but during those 3 months I could really see it clearly because I was on the outside with the outsiders and looking in did not look so good. This is what it looked like. As followers of Christ, we adopt all of these other beliefs that really have nothing to do with Jesus dying on the cross for our salvation. These beliefs might have more to do with politics or cultural preferences. After a while, each church begins to appear homogenous in that its congregants tend to agree on ideas not in the bible. The average outsider cannot tell that there is a line between biblical truths and personal preferences because everyone seems to agree on just about everything from dress code to radio stations to political party to social graces. The outsider sees this and thinks that being a Christian means knowing better than to wear a hat in church or knowing which way to vote. To the outsider it is overwhelming and it is clear when you don’t fit in. We wear these beliefs as badges and present them on social media. These “belief badges” have nothing to do with the love of Christ but we excuse it as love or pride even though it looks and feels unwelcoming and exclusive. We relish in the us versus them mentality and when we go to church we join the congregation in cheering each other on and shaming the behaviors of the very souls that we claim to be praying for all the while failing to see our own shortcomings and forgetting to first take all of our concerns to God through prayer. There is a real world out there that needs to know what love truly is. In my research, the world thinks we look angry. Maybe I now sound angry and judgmental too. Like I said, I am guilty of all of this as well. I have been convicted that this cycle is not helping the world it is actually driving people further and further away from Jesus. I’m ready to try something new. You too? 4. You fall in love with Jesus all over again. Ok, I might have gotten really passionate about that last one and I hope I didn’t lose you because this one right here is my favorite. When I didn’t go to church for 3 months the best thing happened to me: I fell in love with Jesus all over again. I don’t know, maybe the time away from the rows of pews was like a vacation for me and my savior to relax and enjoy each other’s company. 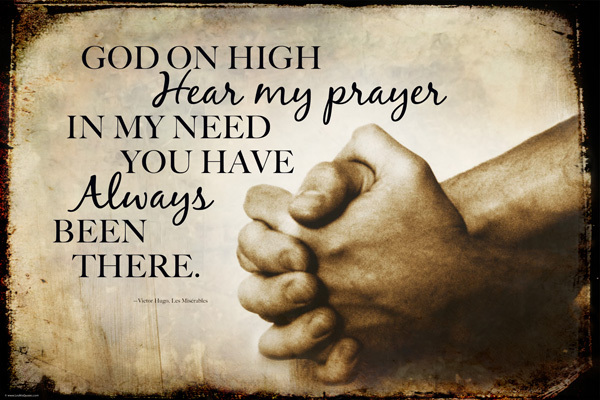 Since I was often alone with nothing more than my prayers it became easier to pray throughout the day. And while I was praying/ meditating throughout the day I began to see more and more how I need Jesus in every second of my life. Left to my own devices, I am nothing but selfishness and mischief. I already knew that I need Jesus every single day of my life but because I was in a state of heightened awareness my self-reflection was highlighted. In evaluating myself all I could think was thank God I have my Jesus. Thank God I have a savior who saves me from myself! 5. I miss church as a community. I’m still not exactly sure what is at the root of #5. Maybe it’s the Catholic school girl in me that just adores systems and organization and the routine of going to church on Sundays. Maybe it is because the new testament speaks of gathering together to pray for one another and to worship together. Maybe it is because I really missed hearing about God from someone else’s perspective. Whatever it is, I really missed going to church as a family. Please understand that this list is not an encouragement to not go to church. I did not purposely skip out on church. I think it was a gift; a short season of my life for me to reflect on why I do what I do and a season to listen to what church needs to become for me. It was a time of preparation. I’m pretty sure I already knew some of this but I needed to be reminded and my thoughts refreshed. It’s one thing to be told these things, it is another to experience it firsthand. All across the country churches are changing, adapting to the next generation. I have been to churches held inside of coffee shops. I have been to coffee shops housed inside of churches. Sometimes I wish that church could be as simple as the experience of going to the coffee shop. You walk in at your own pace wearing whatever you just so happen to be wearing because you are going to a place where you know you will feel comfortable. 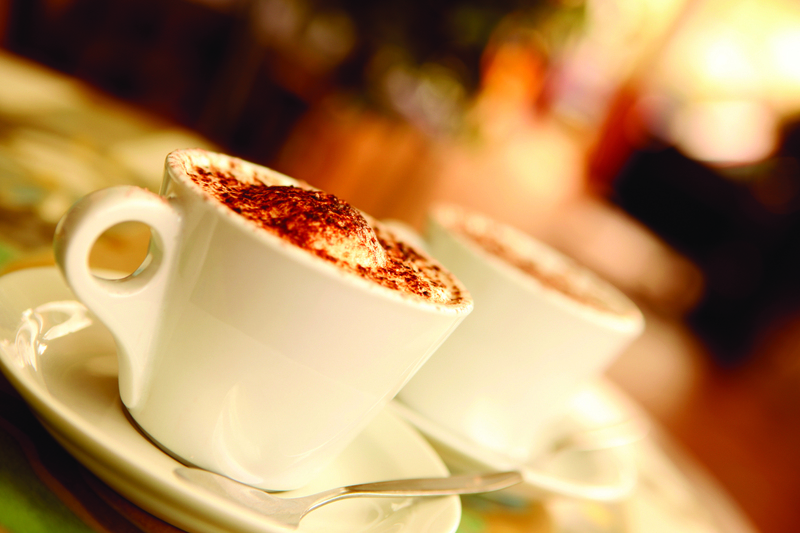 Someone pours something wonderful into your cup or places something delicious on your plate. You sit down with a small group of people and listen and speak and pray and savor. Perhaps you take a moment to enjoy the music that plays in the background. You pour out your heart as Jesus is poured into you. Pass the sugar and cream please- I could get used to that! Found On alwaysrooney.com via Pinterest. This is not my image. I wish I could just fix everything in this house. Right now. Today. Sometimes I get this feeling like I just want to jump out of my skin, out of my body. I’d be like a ghost flying around a million miles an hour and I would do every single little nit-picky home improvement idea that plagues the “to do” list in my head. I would do it all perfectly, and in one fell swoop and it would only take me 15 minutes. And then everything would be perfect as it should be and I would finally be free to live my life. Then, and only then, would I feel ready to focus on my marriage and our family business. Once ghost Elizabeth saves the day by saving this house then I could have my brain back to sign my kids up for karate and ballet and piano lessons. Just imagine, with my house in order I could finally have time for all of those other crazy ideas I have floating around in my head, each one like its own little ghost waiting to be released. I might even have time to sew or maybe even play with my kids or go on a date with my husband. I love a little sarcasm every now and then- I hope you enjoyed it too. Of course my marriage and my kids are a much bigger priority than home renovations; and I do play with my kids and go on dates with my husband. I also know that turning into a magical being that can renovate houses in the blink of an eye is not going to happen. I am not a fairy or a wizard and this is not Narnia or Hogwarts. Get back in your cages little idea ghosts floating around in my head. You all are just going to have to wait until I can release you one at a time. One long summer, home improvement work weekend at a time. I wish it were that easy to tell these little ghost ideas to go away. They are driving me crazy. It is so frustrating. We were absolutely, 100% sure that we were doing the right thing when we bought this big white fixer- upper house two years ago. We had our reasons. This was our big leap of faith especially since we are not big do-it- yourselfers. We still love this house, in a lot of ways it is just perfect for us. But. Every. Single. Room. Needs. Work. Now for a little first world venting that will sound like I am a spoiled little princess. Stay with me – I’m not actually that shallow. Sometimes, I doubt that we made the right decision because I am just so tired of do- it – yourself stuff. 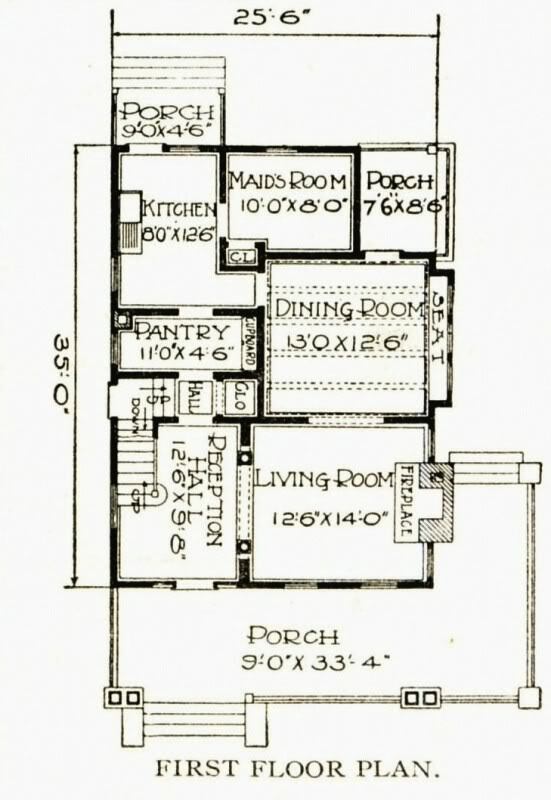 We are talking about 5 bedrooms, 3 bathrooms, 1 living room, 1 dining room, 1 office/study, 1 kitchen, and a huge attic the length and width of the entire house that just needs to be a third floor of some kind. Even the 2 stairwells need work. I know, I sound like a terrible person. I should only be so grateful for all of the space and I am grateful. It’s just that it is a lot of work for one person to take on and a lot of money. We would need thousands of dollars for each room not to mention time and labor. When I start to think of it like that I get overwhelmed and depressed. I am embarrassed to admit that because it is silly to be depressed about the big, beautiful house you live in, right? But I have always said that I need to live in this house because she speaks to me, she teaches me. I know where God is going with this one. The lesson to be learned here is so obvious to me: be content with what you have. But I am stubborn and a slow learner and I am an American so that is hard for me to get a hold of sometimes. I love my country but the good ole’ US of A is a consumer driven society. The world around me tells me to get more, buy more, want more and all because I deserve it. So contrary to what God says. So I have my little mantras and bible scriptures that I repeat in my head to repel those ghastly ghosts of discontent that disguise themselves as “ideas.” “Keep my eyes on you Jesus.” “Be patient and wait.” “But seek first His kingdom and His righteousness and all these things will be given to you.” The latest one that has really helped me when I start to feel envious of people with homes that are “perfect” is, “the only person that I need to compare myself to is Jesus.” He is the only standard that I have chosen to live by and, therefore it is useless to compare myself to anyone else. Even still, it’s hard not to find myself anxious with home improvement ideas. I feel like I just can’t rest until everything is as it should be. Is there anything in your life like that? Is there anything that keeps you up at night? Is there a nagging voice at the back of your head that is keeping you from living the life that you have right in front of you? I have realized that I really live in two different houses. One is the house that I actually live in- the one with all of the problems. The other is the house that I live in my head- it is the version of the house in which all of ideas have come to fruition. All the walls are painted and the floors are finished and the garage is connected to the main house via a new family room and kitchen addition. But that is not the house that the kids will remember. 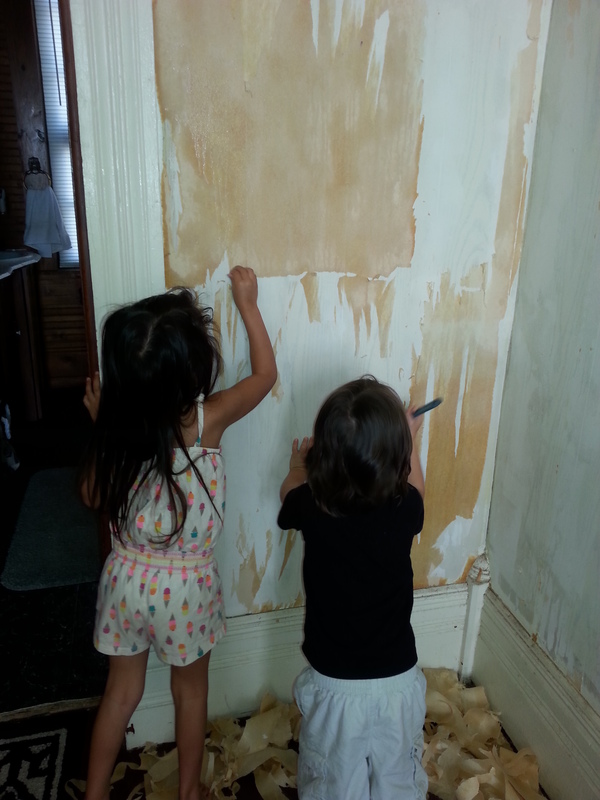 They will remember the Saturdays spent scraping off wallpaper with their mommy. They will remember sprinting from the main house to the garage on rainy days. They will remember mommy and daddy removing splinters from their little feet from the unfinished wood floors. This is their life right now. This is my life right now. 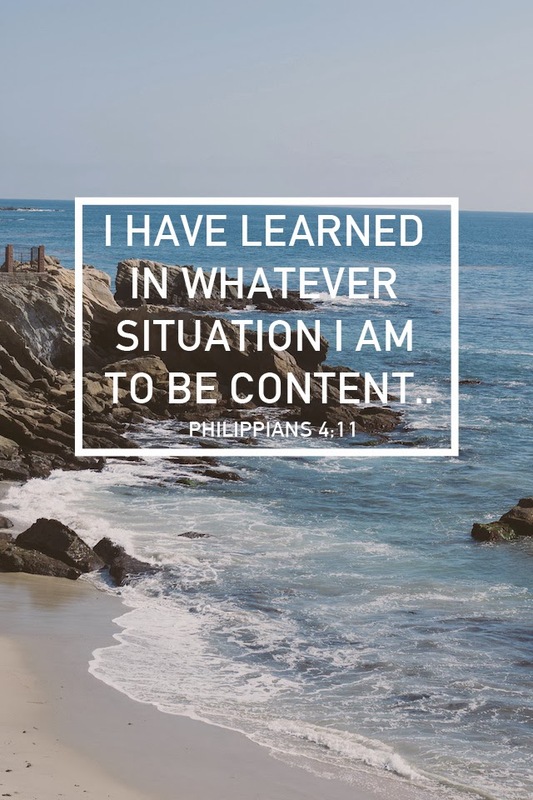 Recently, a friend and I were talking about contentment and our lack thereof. I pointed out that when my husband was in law school all I did was complain about this, that, and the other. He was always so busy studying and I hardly got to see him. I didn’t really care for our house that much. I had to go back to work after I had our two babies even though I really wanted to be a stay at home mom. But now when I look back I have this romantic memory of law school as being the best years of our life together. I think of all the law school friends and friends from my job who kept me sane through those years. Truly, they are some of the best friends I have ever come across. Now, when I think of our law school house I only have memories of hanging out with my sister in the living room- watching hilarious YouTube clips and the fireflies that illuminated our neighborhood in the summer. I reminisce about how I had my dream job. Yes, I had to pump breast milk during lunch but I had my dream job and I loved it and I miss it now that I am a work from home mom. I really only remember the good things about that chapter of our lives. I don’t know how long this season of living in an unfinished house will last. Five years? Ten? Twenty?! Who knows. But I think that when this house is indeed living up to my standards and is “finished” and a new chapter of life has begun I will miss these days. Maybe in the future when our weekends are filled with karate and ballet and piano lessons, I will miss the Saturdays spent working on the house while the kids played in the backyard. Maybe when the teenage years are upon us and I suddenly seem to serve no purpose to my children except for spending cash, I will miss the days when they would plop onto my lap with the tweezers and ask for me to remove a splinter from their little foot. Oh, I am getting teary eyed just thinking about it. For several reasons we have had to push the brakes down on some of the projects that I would like to do right now. Perhaps it is a good time to just enjoy this season in all of its unfinished glory. It’s a good time to stop and realize that these are the days that will one day be the best years of our lives. I don’t believe in ghosts so maybe it’s time to stop being haunted by the ghost ideas in my brain. Twenty years from now when the kids look at pictures from this time they will notice the awful wallpaper in the background and they will smile and say, “Oh yeah, I remember that wallpaper. Remember how mom would make us help her scrape it off? We even had our own scrapers with our names on them so we couldn’t fight over them.” And I will look at that very same wall in its 20- years- from- now state and all I will remember will be those little tiny fingers scraping off wallpaper at my side. And I will think to myself that these were the best years of our lives. 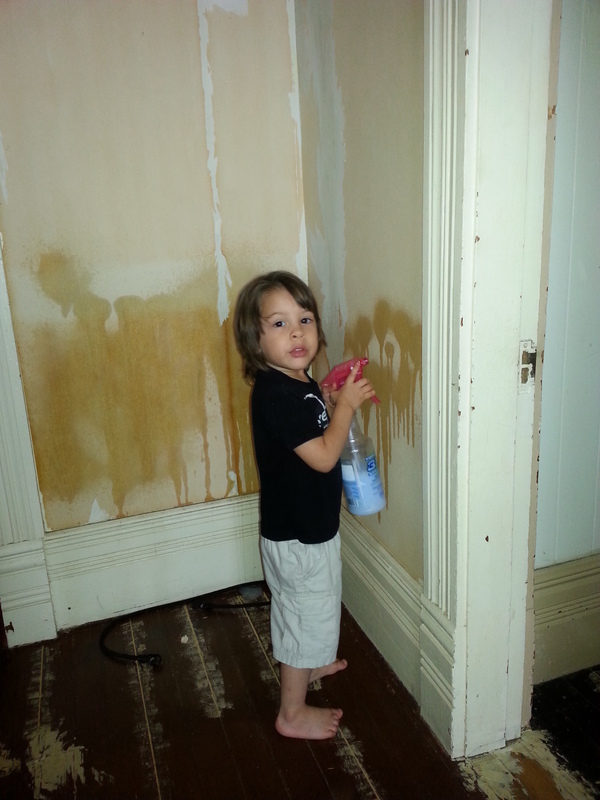 Eva and Elijah Scraping Away: Teach ‘Em Young! Blue skies, soft breezes, mild temperatures, not a cloud in the sky for miles ahead of us- this is how we began our journey. Kids in the back, sister as co-pilot, armed with the best playlists and snacks- we were ready to cross the great state of Texas. We got this. Classic road trip. Then, there it was. A wall of clouds stretching from north to south as far as the eye could see. The wall cloud was so tall that my sister actually thought it was a mountain range. The ominous wall seemed to be rolling towards us. It was something out of an apocalyptic movie. I had never seen anything like it and I have seen my fair share of snowy days after living in Minnesota for four years. It was enormous. It was dark gray. And we were heading straight for it with my two babies sound asleep in the back. From the outside there was no way of telling what the driving conditions would be like from within the strange cloud wall. But if we wanted to get home we were going to have to go through it. There was just no getting around it. I mean, we were literally in the middle of the desert. Nowhere to go but through. 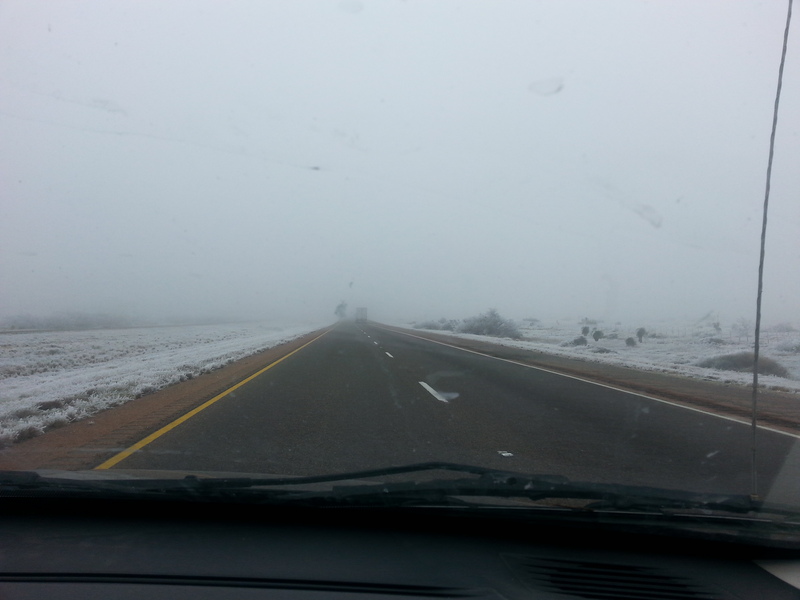 As soon as we entered the cloud wall it was as if someone had waved a magic wand and had frozen everything in sight. It would appear that queen Elsa had just passed through. 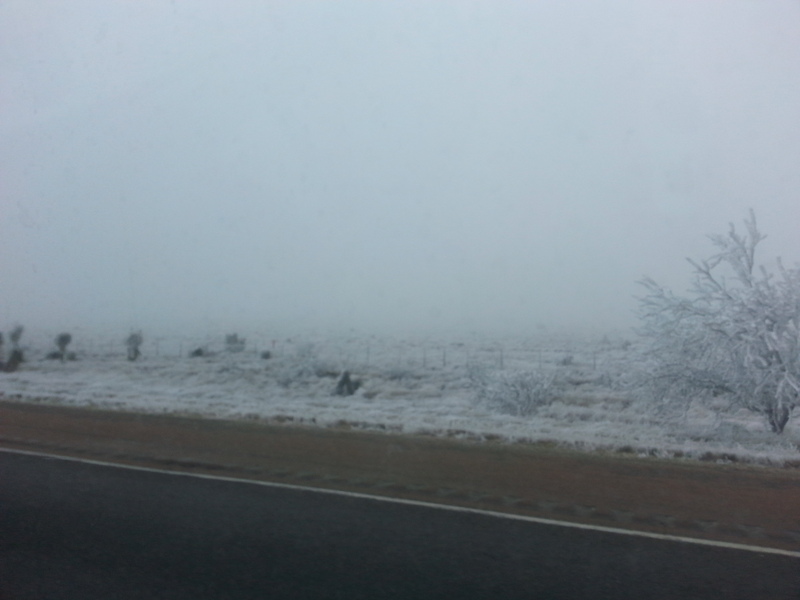 Just seconds before we were looking at sunshiny skies over dusty cacti and suddenly everything was frozen solid. There was no snow or rain. 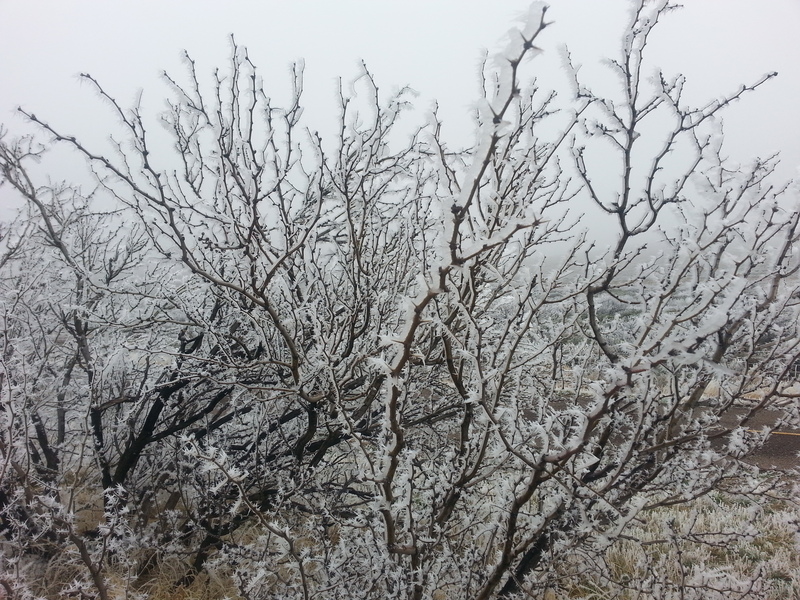 It was as if the air was too frigid to mess with moisture and instead everything was thick with white ice. The scene reminded me of what my freezer looks like if you leave the freezer door open all night- everything coated with a thick layer of white ice. It was beautiful. It was quiet. It was frightening. Maybe it was the vulnerable position we were in, two women with small children idling through a sinister mist, but I quickly realized that I felt very alone. It was the kind of alone in which you have this desire to go back home but you are not exactly sure what you mean by “home.” I thought about my beautiful house and my loving family and it was immediately apparent to me that I was being ridiculous. How could I feel alone when in reality I am surrounded by loved ones and I have a beautiful home? Except that it wasn’t ridiculous. For the past couple of years my little family has been on a challenging journey of sorts. We have experienced all manner of frustration and doubt as we continue to pray and have faith that this “thing,” this goal will somehow come to fruition. 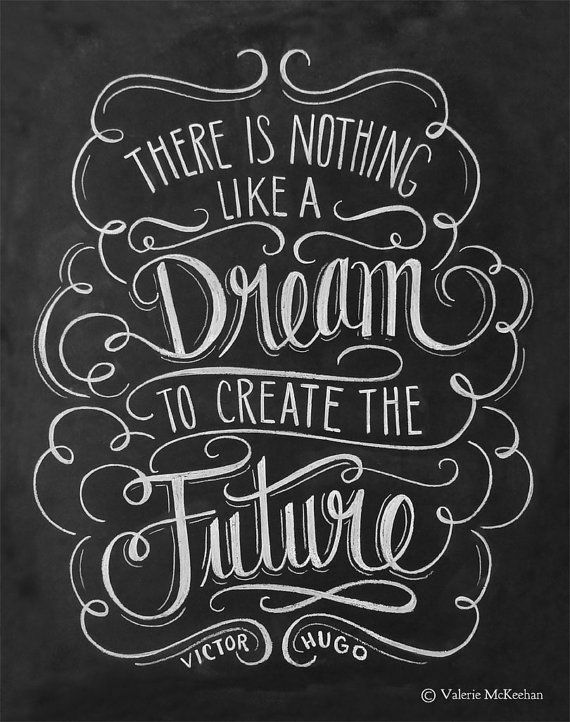 We don’t know how this dream will be realized or how long it will take or if we will even live to see it. Let’s just say that we kind of feel like Noah at times. Here we are building our ark even though we don’t exactly know why because we have never seen rain. That is the journey that we had been on when I was fortunate enough to experience the crazy winter weather in the middle of the desert. My soul was aching with melancholy doubt; I was just trying to hold onto the dream when I first got glimpse of the ice cloud wall. When I began to feel alone I took a hold of those feelings and harnessed them to make sense of this journey that really feels like a ship lost in the fog. What I came up with is that on this journey you never really know what is going on in your life. You really have no control and that fog of not knowing what lies ahead is scary and seems dangerous. It makes you just want to get back to a place of comfort and security. And so you try to find that security. You look for that warm fuzzy blanket or your favorite lovie- something, anything to cling to. But sometimes there is no way to attain comfort and security in this world. Sometimes you have nothing to turn to and nowhere to go but through. That beast of not knowing must be faced and conquered and tamed. And yes, you should feel a little scared and vulnerable. The vulnerability heightens your senses; it pumps you up with the adrenaline you need to be brave. You just have to have faith that God will bring you through this journey. Not long after the drive through the freak polar vortex of Texas, my husband and I took a drive down the Pacific Coast from Seattle to San Francisco. It has always been on my bucket list to experience the majesty of the great giant Sequoia Redwood trees. 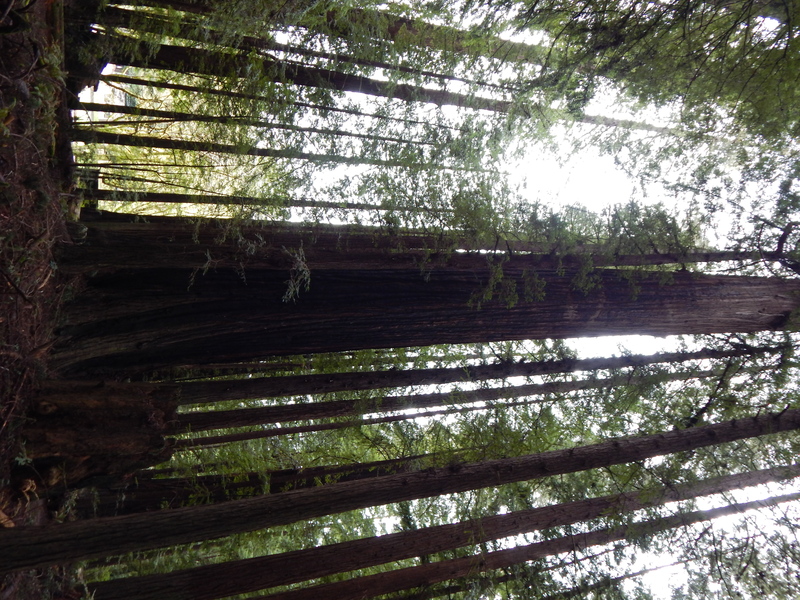 While driving through the redwood forest I felt claustrophobic and insignificant. I was sick to my stomach from the winding roads and change in air pressure. At times the forest was so dense that the trees completely blocked out the sun. It could be a sunshiny day but you would never know that in the redwoods because the trees had conquered the sky. 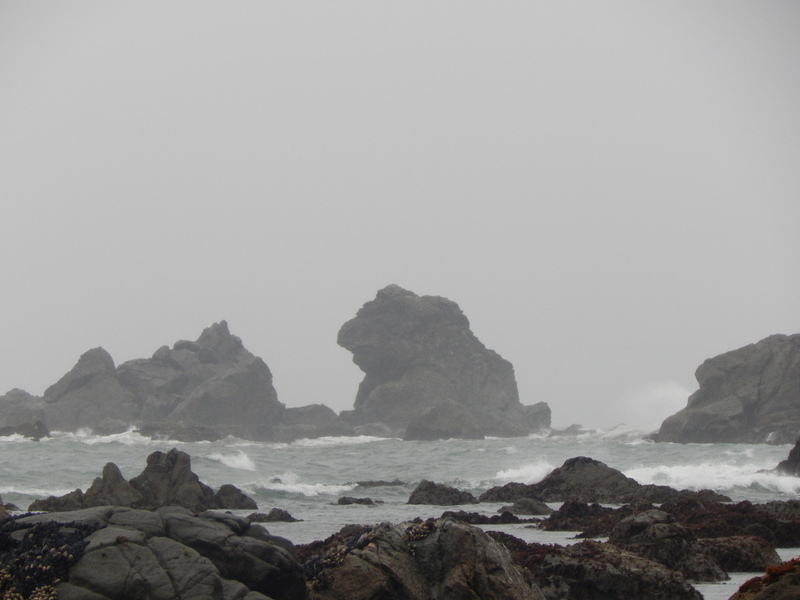 Naturally we drove past huge cliffs and bluffs that dropped into the icy Pacific ocean. The cliffs were breathtaking and catastrophic looking- an insurance company’s nightmare. Each wave that crashed upon the black rocks was a warning to stay away. So of course this meant that we just had to climb down the rocky cliffs despite a rain storm and warning signs that we were entering tsunami hazard zones. But who could resist getting a closer look at the ocean filled with all manner of mystique? Here’s hoping the tide doesn’t come in! In places like that, places in which nature demands your attention and announces its strength by simply being there, I am reminded once again that I really have no control of my life. I could run my day on schedules and events and budgets but an gigantic wall of ice could just go ahead and sweep through my life and commandeer my plans for the day. Or, a tsunami could just come on through and knock all of my kingdom down just as it would knock out all of those stately redwoods. Just like that. And of course I know this already but I am hard headed and sometimes I have to be reminded. Those of us who have chosen to be on this journey. Those of us who have our heads in the clouds. The dreamers. The crazies. Those of us who keep the faith and muddle through the unknown focused on a mission. We have to know that we are not alone. It’s going to be murky and it’s going to be a windy road and a little scary at times- you might get nauseated- but we can’t be afraid to take that first step into the cloud wall. We can’t be afraid of climbing into the tsunami hazard zone. We must trudge on through. Something you have never seen before can be a little scary like the height of the redwood forest or the fluorescent looking moss on the trees in Oregon or like an enormous cloud of ice in the middle of a Texas desert. We just have to go through it and maybe allow ourselves to get swept up in the mysterious beauty of the unfamiliar . Perhaps if we take the time to admire the beauty of the unknown we will begin to feel more like we are home. Maybe we can learn to live within the fog. 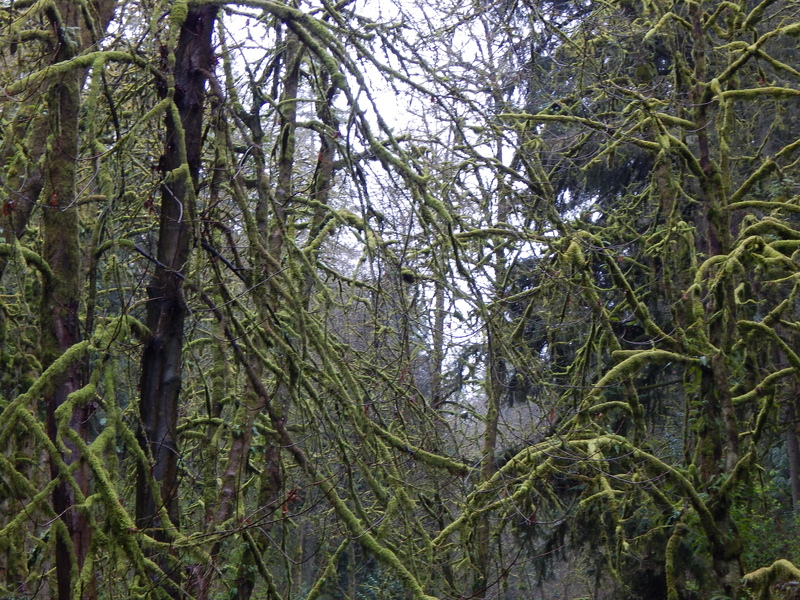 I have never seen fluorescent looking moss on trees before. I don’t know what kind of trees these are but they were everywhere in Oregon. “Who I AM and Why I AM Here” is a writing topic that I have been assigned from the blogging world but lately I am constantly asking myself, “Who AM I and Why AM I Here?” The first is a statement. The second is a question. Right now, I prefer the question. I have always been drawn to the idea of taking a leap of faith. Even the statement, “taking a leap of faith” appeals to who I am at the very core of me. A dancer since preschool, leaping through the air is a great passion of mine and faith… well… faith is my language. I am the most content when I am alone in prayer with Jesus. Not trying to be a weirdo; I just have to be honest. Lately hope has become my new obsession. Maybe it is because we live in a world that seems to be inundated with the doom of impending apocalyptic scenarios that I have become infatuated with the idea of hope. Or maybe it’s because I am living way out of my comfort zone in a small country town just clinging onto a thread of hope that I will witness a miracle coming to fruition. Or maybe it’s because I am a work from home mom just trying to survive through the daily grind while simultaneously attempting to renovate a 118 year old Victorian era house and supporting my husband in the start of his law practice. Breathe. Sigh. Hope. I wake up every day wondering how I got here. How did I end up in a small town living in a 118 year old house with flower speckled wallpaper? This is so not me. I am not that kind of girl who likes renovating houses and country living. No. I am a city girl. I thrive on the energy of traffic and diversity and progressive thinking and anonymity and amenities galore. Don’t get me wrong, small town living definitely has its charm and there are plenty of wonderful people around these parts. Nonetheless, it has been quite the adjustment for me. Again, why am I here? I am here because I feel in my bones that me and my family belong in this house. Even if the only reason why we moved to this town and into this house is so that I could have plenty of stories to write about, that is fine with me because I just know that I belong here. I am in the right place. Why is this the right place? I don’t know but I am willing to get to the bottom of the great mystery that is God’s sense of humor to move our little family to a small town (something we swore that we would never do). In the almost 2 years that we have lived in this house, I have discovered that there is an amazing beauty that is lurking around the mundane and trivial pursuits of life. In a way, this house has revived me. While I feel like we are constantly renovating the house, I think it’s actually the house that is piecing me back together through the labor of love. 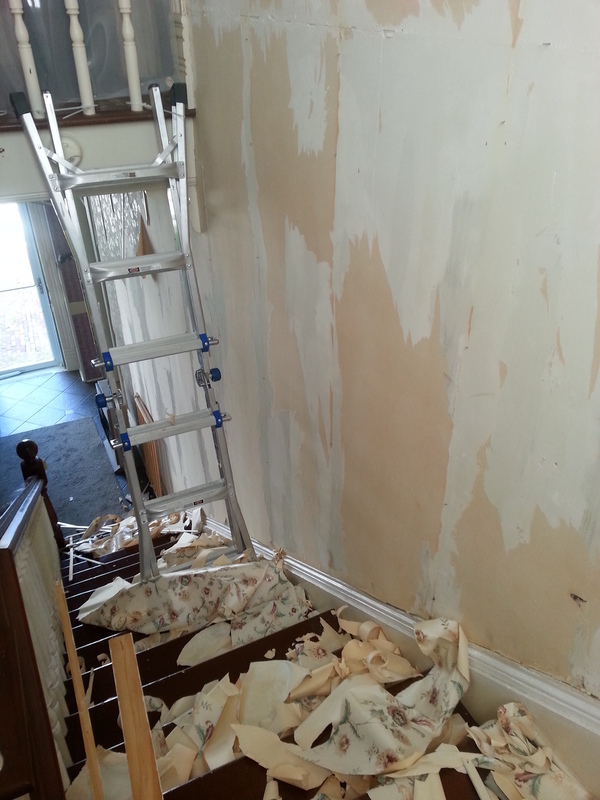 I guess that’s why I decided to start a blog about the quirky stories behind renovating and living in this old house. It was something that I felt just needed to be done. I don’t know where this is going but I couldn’t keep running from the fiery urge to share some of the beauty that surrounds this house even though the house sometimes feels like it is falling apart. But that’s exactly it: WE are beautiful even when we feel we are falling apart. This little project is my great leap of faith into the vast unknown that is the internet. I hope that you will visit and dance with me a little. I finally applied this wall decor in my daughter’s room. I have been wanting to do this since before she was born. She is now 4 years old. You take a pregnancy test. You see the plus sign. You tell your husband. You get happy and excited. You get so happy and excited, in fact, that you feel as if you are riding a natural high- as if you have dipped your cup into the fountain of life and have drunk its sweet nectar. Yes, you have life growing within you. You are the picture of bounty and youth. You and your husband talk about names and gender and imagine what the baby will look like. What kind of personality will he or she have? The two of you make plans to tell your parents and guess as to their reactions. You tell a small handful of people- just your small inner circle and challenge your creativity as to how you will dazzle the Facebook world with your super clever baby announcement and social media gender reveal party. You tell yourselves that you will enjoy every single second of this pregnancy despite nausea and sleep deprivation because you realize that your first two children have grown up way too fast- better to appreciate every last drip of this baby’s being because it will slip through your hands all too quickly. You have no idea just how quickly this baby will actually slip through your hands because right now you are in the moment enjoying the circle of life. Hand in hand with the love of your life, you visit the birthing center and meet the midwives and recall the amazingly beautiful birth stories of your children. You are nervous. Naturally- this is child birth we are talking about here. It will be painful and dramatic but so worth it. This is what you were born to do. You have never felt more alive. You tell your children. One is so happy he can hardly contain his little happy dance. The other folds her arms across her chest and scowls. She has been here before and is not happy knowing that now she has to share you with yet another sibling. However, you show them age appropriate videos and her disposition changes. She is a little scientist. She is willing to accept the challenge of big sister yet again because now there is a logical process that she can observe and study over time. She’s in. And then, its over. You wake up after a series of restless nightmares and realize that the nightmares were real. Hand in hand with the love of your life, you go to the doctor and sit in the waiting room with its fluorescent lighting and parenting magazines casually strewn about the coffee table and you do the ceremonial dance of the waiting room- twiddle your thumbs, tap your feet, cross and uncross your legs. All the while you sit through an excruciatingly numbing pain. What is taking so long? There is confirmation and explanation and clarification and reiteration. You are thankful for the medical profession. You are thankful that you are not alone. You ask all your questions, take mental notes, and go home. You hug your husband and he hugs you. Hand in hand with the love of your life, you pray. You tell your children. Reality flies right over the happy one as he dismisses your words and pretends as if you said nothing. You know that this is a natural, age appropriate response. The scientist astounds you with her profound words of comfort. You wonder, who is this child? You thank God for the children that you have in front of you. You don’t cry. You not crying alarms those closest to you because you are the kind who cried during every single sappy Super Bowl commercial. You attempt to proceed with business as usual. Until 24 hours later, you catch a glimpse of a cardboard castle that you built for your daughter and for some strange reason this little castle sets you off. The flood gates release and you cry finally and uncontrollably for a long time. “I have lost a baby.” You finally whisper to yourself. You sleep. You eat Nutella straight from the jar. You talk to your mom. A lot. You talk to your girlfriends who have fought this battle before you. You are thankful for the sisterhood. You cry some more. You marvel at how well your husband has handled his grief and how strong he is until you realize that his grief looks very different from yours. Grieving together is awkward but you try to talk about it. You thank God for your man and for all men in general. You wrestle with God. You listen to Nirvana and other 90’s teen angst music from your youth. A lot. You journal and you allow yourself to go through the 5 steps of grieving in your own way. You remember how happy you were just a few days earlier and you linger in the angry stage and then camp out in the depression stage for a while. You are angry at yourself for silly things like the fact that you are angry. You have never felt more alive. You Netflix- binge- watch “feel good sitcoms” with your sister until Netflix asks if you are really still watching this same show after several hours. The two of you laugh. It feels good to laugh. You are thankful for your sisters. And Netflix. You get dressed up and go out to eat and go shopping and eat/drink girly desserts and adult beverages with your sisters. You go to museums and relate to exhibits of pain and suffering and are thankful for what you have. You think of the baby and realize that you do believe in love at first sight after all. You continue to tearfully pray and cling to your faith. You continue to feel guilty that this loss has made you so incredibly sad. You never saw that coming. You feel like it is ridiculous to feel so sad. But the answers to your prayers tell you otherwise. And then, it’s over. Well, kind of. You wake up one morning and you start to feel a little bit like a human again. You are still sad. You still miss that baby. But you remember who you are. You remember who God is. Your head attaches itself back to your body and your feet begin to move. Slowly. You suddenly have the urge to, of all things, decorate? You find this both surprising and inefficient because you live in a 118 year old house with most of the walls unsuitable for hanging pictures due to either cardboard walls or out of date wallpaper that must, must, MUST come down. Your mentality is that you will not hang any pictures until all wallpaper and cardboard walls have been removed and all walls have been appropriately painted. You decide that you don’t care. Desperate times call for desperate measures and there are some walls that are picture hanging ready. 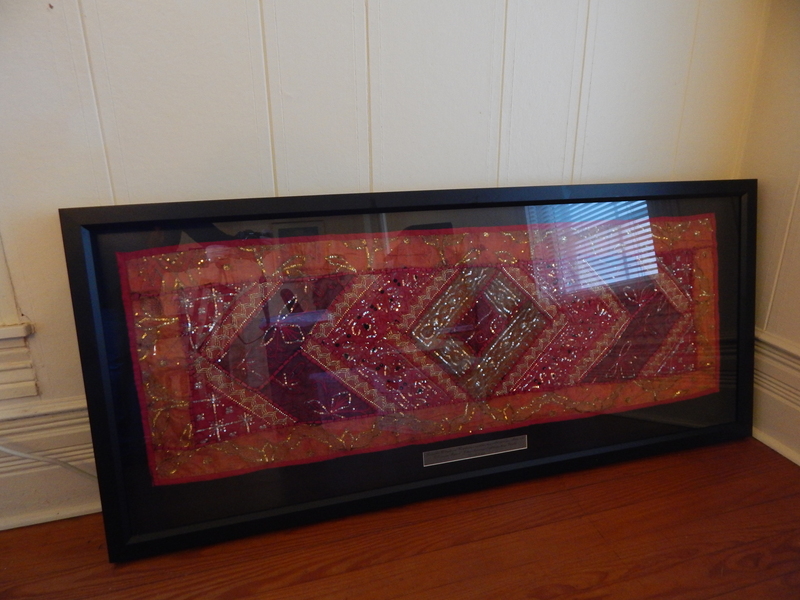 Table Runner from Israel that my husband gifted to me. It is to be hung on one of the cardboard walls once the wall is redone. Your desire to adorn the walls with beautiful things is so strangely inappropriate to you that you have to wonder why? Why now of all times? As you go about the business of decorating your home and hammering nails into the completed walls you begin to realize that every photograph tells a story. Every painting evokes a feeling. Each mirror calls for reflection. Each vase, a vessel to be filled with the grace of nature or purposefully left empty to be enjoyed in its contemplative simplicity. 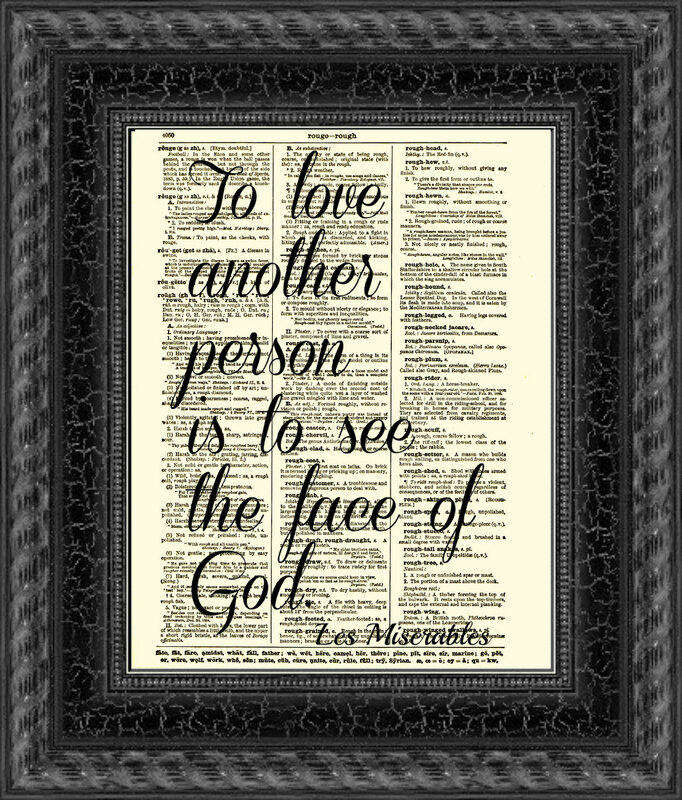 Each motivational saying or bible verse, a familiar whisper to remind us of who we are. 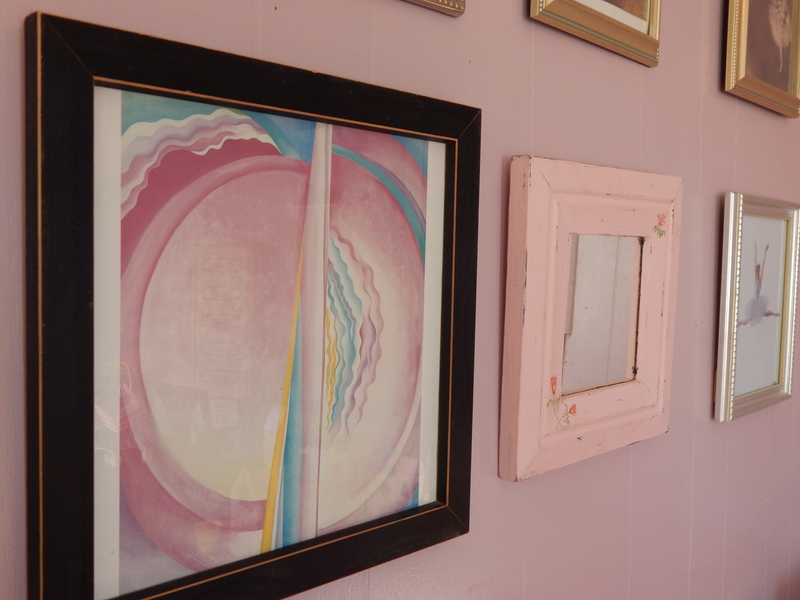 Georgia O’Keefe hangs in nearly every room of this house. I think it is safe to say that she is one of my favorite artists. I might actually have too many O’Keefe prints in my house. You realize that the walls of your house are lined with stories and feelings and reflections and grace and contemplations and encouragements. You understand that the loss of your third baby is and will be a story to be felt and reflected upon and that it too will line your walls as a testimony of God’s grace. The Lord gives and the Lord takes away. You have never felt more alive. 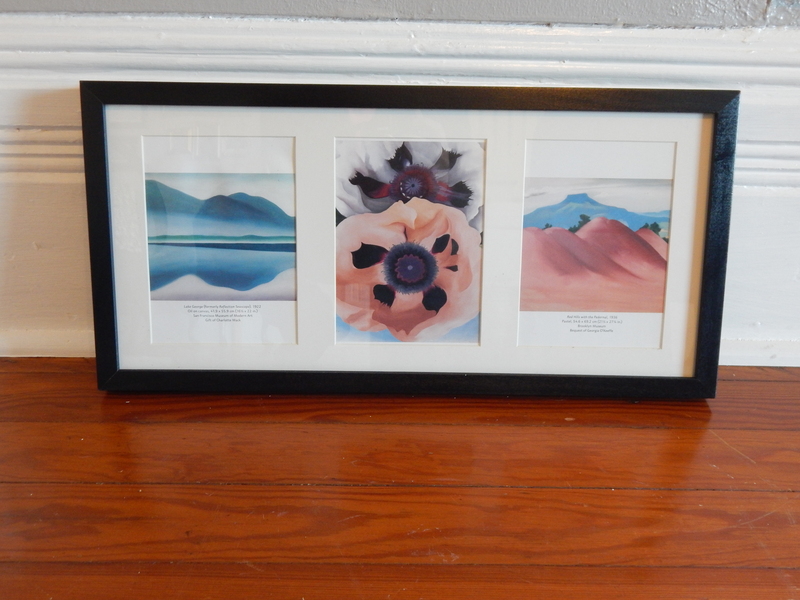 My daughter asked for this Georgia O’Keefe work titled “Pink Abstraction” to be hung in her room a midst pictures of ballerinas. You decide to return to your regularly scheduled program. You let your kids crawl into bed with you in the wee hours of the morning and you take the extra time to enjoy their coos and snuggles. You get back to work all the while taking the time to appreciate that this is where you live. This is who you are and these pictures on the walls speak of the beautiful and sometimes painful moments of your life. But they are your beautiful and painful moments to hold and to remember. This is life. And you come to terms with the realization that one day when it is all over you will hold this little angel in your arms. You hang the picture up on the wall and contemplate its simplicity as you are reminded of who you are and who God is. 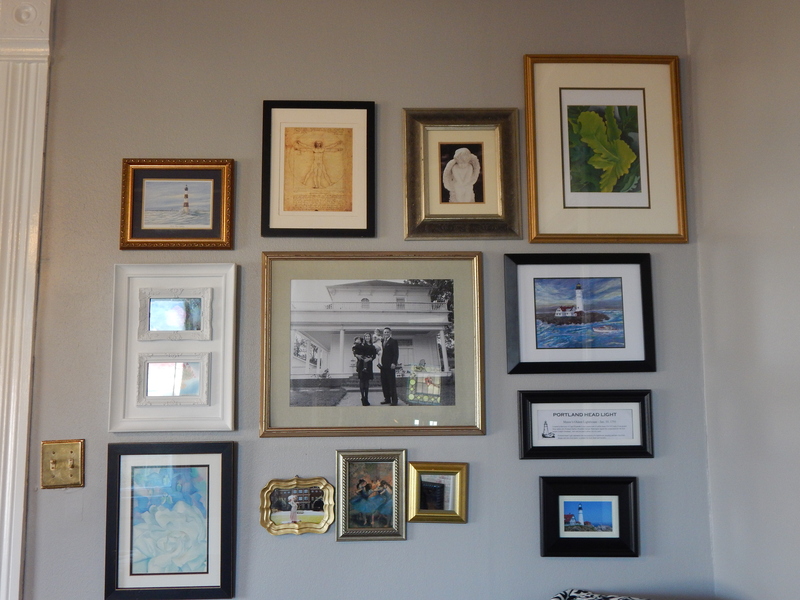 One of the walls I worked on- adding and rearranging pieces. Still need to fix some that are crooked. This is not my image. 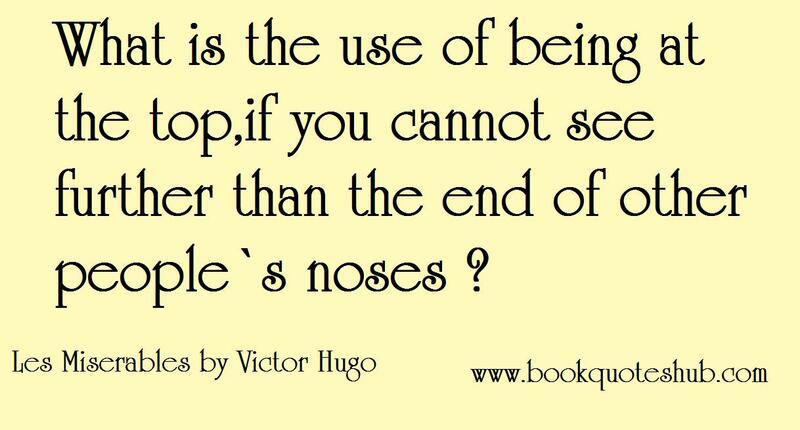 I just love Victor Hugo quotes to go with Mr. Richard’s story. What makes a man the kind who would pull the trigger and take another man’s life? I’m sure there are a lot of ways to answer that question but Mr. Richard’s is a smudgy portrait of a boy with a rocky home life growing up in the Ozark Mountains of northern Arkansas. It’s not an excuse for murder but it might shed some light on the situation. Richard’s childhood was not something that he really wanted to talk about when we got together nearly a month ago. His description was brief but painted a picture of violence, hate, and frustration. Richard said that he didn’t really know right from wrong. Sure he was taught how to behave in school and church but while at home there was still no defined way to distinguish right from wrong. 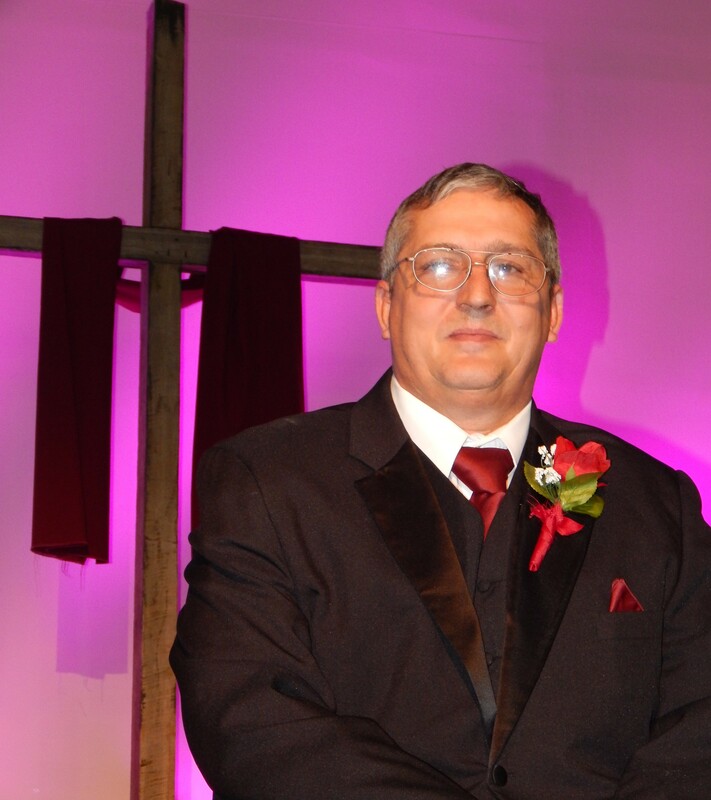 His family built churches and they were the type of family that attended services at the United Pentecostal church throughout the week and twice on Sunday. 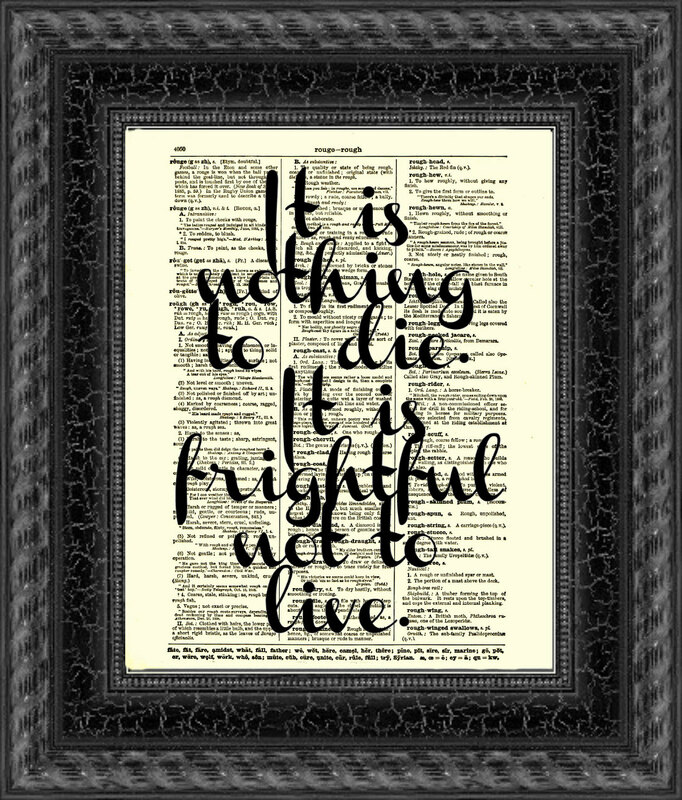 Even still, Richard described his home life as being sick in thoughts, beliefs, and actions. I know this kid. When I was a teacher I had several students like this who sat in my classes throughout the years. Every class has “that kid.” You remember “that kid.” Maybe you were “that kid.” He or she was the one who was frequently tardy or absent or constantly in trouble talking back to the teacher or principal. You know that kid. He or she is the one who can’t sit still and just doesn’t know how to behave. “That kid” usually comes from a tumultuous home life. Even though I didn’t know Richard as a child, I think I can guess as to what he must have been like. So what happens when you have a kid who grows up in a consistently horrible mess? The kid grows up into an adult who does messy and horrible things. Train a pit bull to be a killer and he will kill. I know it doesn’t always happen this way but more often than not, I think it does. That is, until/unless God grabs a hold of their life and transforms that smudgy portrait into a work of art which was the case with Mr. Richard. When Mr. Richard was completing his life sentence in prison for the murder of his friend, the thought occurred to him that he may never hold a baby or hear the giggle of a child ever again. He considered this as part of his penance for his crime. Even after he repented of his actions and became a sincere Christian, Mr. Richard still could not imagine being on the outside watching children splash in the summer spray of sprinklers. Flash forward to 2014 when my children nearly tackle the man to the ground with hugs of excitement at his every visit. During his month and a half stay with us, our children grew very fond of Mr. Richard. He was there in the background for a short period of their childhood. Mr. Richard was there at my daughter’s birthday party hanging up balloons and helping with the piñata. He carried my sleeping son to the car after a night of catching grasshoppers and watching fireworks and eating hot dogs on the Fourth of July. There he was inflating plastic swimming pools and pulling out the sprinklers for the kids to enjoy on hot summer days. Mr. Richard rolled through the lives of our children like a puffy cloud providing some unexpected shade on a hot summer day- he was there making their life more enjoyable even if they didn’t realize or appreciate it. Needless to say the kids were sad to see him go the day that he was offered to be the groundskeeper of our church and to stay in the parsonage. However, his new home did not keep Mr. Richard away. Mr. Richard still came over nearly every day. He was family. His new home at the parsonage was one of many little blessings that came Mr. Richard’s way. Mr. Richard seemed to attract these kinds of generous miracles like magnets. A friend from church was able to provide a steady job for Mr. Richard. You have never seen a man take more pride in his work than Mr. Richard. He would wake up before the sun and head off on his bicycle for the 5 mile or so commute to work. Despite the distance, his heart condition, and the exhausting Texas summer heat, Mr. Richard refused to accept rides to work from us. He would even ride his bicycle for miles to make it to his doctor appointments. One day, Mr. Richard pulled into our driveway with a car. His car. His boss had noticed that Richard would ride a bicycle to work and offered to finance a car for him! Have you ever heard of such a thing? That was the first time that I really realized that God had a clear hand on Mr. Richard’s life. It seemed like God just loved to bless him. I knew at that point that I would have to watch Mr. Richard closely because God just loved to do great things in his life. What would he do next? Well, the next best thing turned out to be that his parole was transferred to Arkansas ahead of schedule. At long last, Mr. Richard would be united with his sweet fiancé, Debbie. Mr. Richard and Debbie were introduced by Mr. Richard’s daughter in January of 2014. By Valentine’s Day of the same year these two love birds had pledged their love for each other. Almost a month ago I had the privilege of attending their beautiful wedding. It was the event that inspired me to write this 4 part series. There I was the day after their wedding sitting in Richard’s home with his newlywed bride at his side, marveling at the grace of God as they recounted the stories of the first time that they held hands and the all night phone conversations and daily bible studies that they did over the phone during the year that they were apart. As I listened to Mr. Richard and Debbie blush their way through the telling of their relationship I realized that this whole story was an epic love poem. It is a love story for the ages. A man’s heart is hardened from years of pain and does the worst possible thing a human can do. But God still desires him and puts people into his life to shine hope on the hardened man’s heart. Man’s heart of stone is broken and replaced with a new, soft, and patient heart. Man gives thanks. Man is continuously blessed with generosity upon generosity, each little blessing like a bouquet of roses declaring love for the beloved. I think back to my first encounters with Mr. Richard which were clouded in fear and apprehension. I had the opportunity to witness a part of his story and therefore was intrigued to know more. And so, there I sat on his couch with the notepad and pen that I picked up from our hotel and scribbled down whatever I could all the while trying not to cry. I am eternally grateful for Mr. Richard’s blessing to share some of his story and my hope is that in reading about his story others will be inspired to “lend a helping hand” a favorite saying of Mr. Richard’s. This encounter has changed me as all good stories should change a person. It makes me think of “that kid” who just doesn’t know how to behave in Wal-Mart or at church. I think about that man I see sitting on a corner with a sign asking for help. I see people crippled with drug addictions or with criminal records and I think to myself, what horrible things must have happened to this person to bring them to such a state and what will it take to bring hope back into their lives? This little place that I write, this little corner of the internet is meant to tell of the stories of how my very old house gets renovated. There are all kinds of people who are and will be a part of the renovating. Richard’s story is an example to me that just like God has brought people into my life to help renovate my home, God also has people who come into my life who help renovate my heart. A loaded gun sits on the table. The argument escalates. A second later, a man is dead. And it was all over a waterbed frame and $96. On April 29, 20 year old Richard was sentenced to life in prison for the murder of his friend, Mark*. Mark worked with Richard out on the oil rigs of Texas. In the months that preceded the murder, Mark had stolen money from Richard, had assaulted Richard’s girlfriend, and had written some hot checks. Tension was building by the time April 15, 1984 came around when Richard was to buy a waterbed frame from Mark. Mark took the money but did not provide the bed frame. For the hot-tempered Richard who described himself as a hooligan at that time, it was the last straw. Mark came over to Richard’s house that night to discuss the situation. Unfortunately, Richard’s hot temper boiled over and exploded into an untimely death for Mark. Richard knew he was playing with fire that night. He had purposely left a loaded gun on the kitchen table as a warning to Mark that he was ” about to get tail- kicked” in Richard’s words. When I asked Richard if the shot was an accident he was clear to mention that he grew up in the Ozark mountains of Arkansas shooting squirrel straight in the eye. Richard was a good shot, he knew what he was aiming at. Richard spent his first 8 years or so in and out of solitary confinement due to his rebellious spirit. He went 6 years without seeing the natural sunlight of day. Other inmates steered clear of Richard; his hot-tempered nature branded him with a reputation of a man that was not to be reckoned with. When he was not in solitary confinement Richard was the go to man for your every need. Weed, cigarettes, money, you name it Richard could find a way to get it to you. If he was a hard man before the murder then prison had only made him worse. In 1992, a prison ministry began 4 day bible retreats for inmates. Richard participated in these bible studies as a way to break up the norm; it was a way to have a little more freedom. I imagine Richard sitting in a circle with other hardened inmates, perhaps feeling vulnerable. He was a man that never turned his back to anyone but in those bible studies he was asked to share the most intimate of ideas- faith. It must have been difficult for him to break down some of those walls but Richard was tired of his “hard living.” He was ready for a new start. When Richard and I sat down together recently to discuss this time in his life, he continuously referred to an illustration in which you feel like you are at a hole at the bottom of a ladder that you just can’t quite reach. You want to get out but you just can’t get to that ladder. Richard felt like he was beneath that hole and really needed someone to reach down and pull him up. During this prison ministry Richard experienced well versed Christians teaching these classes but, in his opinion, it seemed like they were totally missing the point. It was clear that they knew the bible backwards and forwards but they still came off a bit stand offish and it was hard for some men to relate to the lofty concepts that were being presented. While these Christians were well meaning, it was the Christians in the group who, in Richard’s words, “fell down a lot” that he could really identify with. It was the people who were honest and admitted that they were not perfect- these were the people that caught Richard’s attention. It didn’t matter if they were well versed in theology. These Christians, you know, “kept it real”. They made a relationship with Jesus Christ seem attainable even for someone like Richard. According to Richard, Jesus got a hold of his life and hit him like a bolt of lightning. Inmates would comment that nothing made Richard mad anymore. Try as they might, other inmates could not ruffle Richard’s feathers. Richard’s hot- tempered nature had melted into a patient peace, a noticeable difference from his tumultuous prison beginnings. It was this peace that finally allowed Richard to forgive himself for his crime. Part of Richard’s sentencing stated that Richard was not to make any contact with the victim’s family. By the time Richard had repented of his crime, Mark’s family members were all deceased. Through prayer, Richard apologized to Mark and his family anyways and asked for their forgiveness. At this point Richard decided to dedicate his life to Mark and his family. From that moment forward Richard sought an education for himself, learned several trades, and set his mind towards being a light in a dark place- dedicating every action to the life that Mark never got to live. The way Richard saw it was that both he and Mark were on a path of destruction and now that Richard had changed the course of his own life, he owed it to Mark to live in such a way that it would honor Mark’s life as well. Richard felt like it was his duty to give Mark a second chance at life in this way. It would be his life-long burden and pleasure to live a good life for Mark. That might seem like an undeserved privilege- to live a good life after you have taken someone’s life but it is indeed a cross to be carried. If it were me, I could see myself crippled with guilt at the thought that I had taken someone’s life. The guilt would probably weigh me down to the point of no relief. Burying yourself with guilt is the easy way to deal with a situation like this. 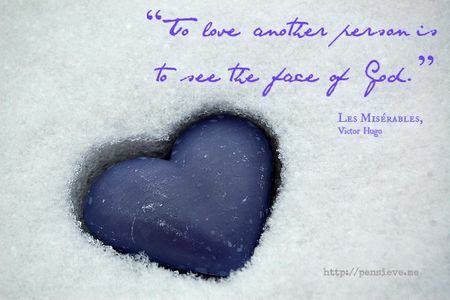 It is much more difficult to receive the free and easy grace of God and forgive yourself. Richard says, “You have to forgive yourself or you can never deal with the consequences.” That made a lot of sense to me. If you don’t forgive yourself then every time you face a consequence for your crime, such as not having a place to sleep at night once you are out of prison, that debilitating guilt would creep back in and drag you back into darkness. Then all the work that God had done in your life would be in vain and that little light would be snuffed out completely. Perhaps the guilt would be so heavy that it would lead you back to another tragedy, another death. I’ll take forgiveness over darkness any day. After 29 years and 6 months in prison, Richard was released on parole probably in large part due to health issues. Richard’s heart was beginning to fail him and it was costing the state too much money to keep him in prison. Richard thought that he might die in prison because of his heart condition, but his heart condition ended up being his ticket out. I find that as a kind of poetic justice; Richard’s heart could no longer be confined to a prison cell. It is especially satisfying to see him on the outside, healthy, receiving proper medication, and always wearing bright colors. Richard loves to wear shockingly bright colors of the highlighter palette. Yes, Richard is a neon sign shining through the darkness flashing “mercy,” “grace,” “forgiveness. “Do I deserve freedom? NO!” was Richard’s response to my husband’s questioning about how he felt now that he was out. “All I can do is live right and follow the letter of the law and be thankful.” With every blessing, with every lovely thing in life Richard thinks of Mark and strives towards goodness all the while flashing the neon light of his story. *Denotes that name has been changed. 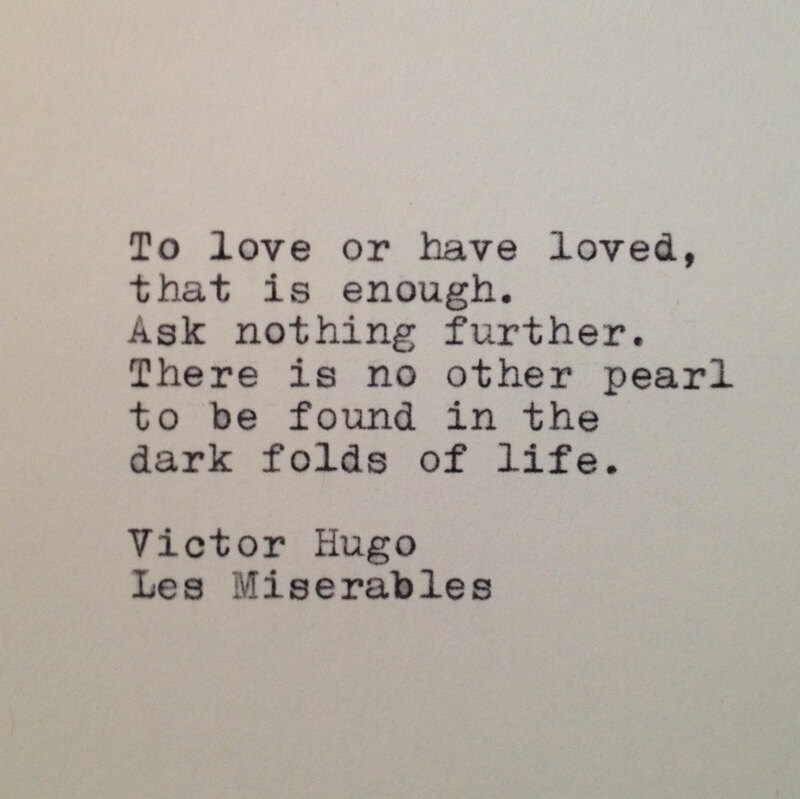 Again, not my image but Les Mis quotes just go so perfectly with Richard’s story. Photo Cred located on the image. Let me set the scene and refresh your memory: a man convicted of murder was sleeping in our family room. Interestingly, I slept like a baby that night. I woke up the next morning both surprised and disappointed in myself that I did not spend the night obsessing over the what ifs that had haunted me the day before. I guess those ghosts had run their course and had floated on out of our house. Yes, God had answered my prayers, however, I came to find that Mr. Richard was praying for his own protection. While I went to bed with murder on my mind, Mr. Richard went to bed wondering if my husband, an attorney, was in cahoots with the County Attorney’s Office to set him up for some dubious parole violation. Richard was trying to walk the straight and narrow and he thought to himself that that would be just his luck- the two attorneys that helped him find a warm bed for the night only did so to incriminate an innocent man. Why else would all these people be willing to help a man like him? Isn’t that just the way our world works? Whenever someone tries to do something nice for us we think, “what’s the catch?” Our world is so cynical and bruised from so much violence that we automatically assume the worst. Richard and I were prime examples of this. Here we were, two harmless human beings racking our heads with anxiety because of the crazy shady world we live in. Its either that or a sign that we watch too much T.V. It all seems laughable now. Just to be clear- there definitely was no plot to incriminate. When I think of the month and a half or so that Mr. Richard lived with us I think of dinner. Lots and lots of dinner. If this were a movie, I would make a montage of all the dinners we shared. The first few would be almost icy with us all feeling each other out and my husband, Emmanuel, trying to break the ice with his witty sense of humor. Then, the montage would melt, a gradual progression, into laughter- lots and lots of laughter as we got to know Mr. Richard and became friends. One day at dinner, Mr. Richard laughed a gleeful chuckle. I couldn’t quite put my finger on it but he reminded me of someone. There was something familiar in his laugh. Later, while my son played with his toy cars, it clicked. 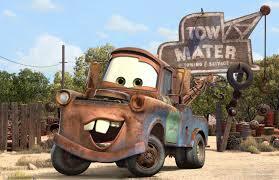 Imagine “Tow- Mater” from Disney Pixar’s Cars franchise. Now imagine that Mater is a real man and now you have Mr. Richard. Google Search for “Tow-Mater” yielded this adorable pic. If this is your pic and you would like me to take it down I will- no problem. Just like Mater, Richard turned out to be the unexpected friend with a big heart. For almost 10 years now I have consistently prayed for God to give me friends. I always have a picture in mind of what kind of friends would be most desired. These wished upon friends are of the happy hour and paint your nails together variety. They are shadows of treasured friendships that I had long ago. But in reality those special friends were reserved for that special time in my life. At least that is what I suspect because God has never given me friends like that again. Instead, God has blessed me with the friends that I didn’t know I needed. Friends that I never would have imagined would be my most trusted allies. Friends of different religions, race, age, family background, interests, heritage, geography, etc. I mean, what could be more different than a 50 something white man from the Ozark Mountains of Arkansas who grew up shooting squirrel and a 30 something Hispanic woman who grew up in a Texas city bordering Mexico where she made up dances in her desert landscaped backyard? In 1983 when Mr. Richard was heading into prison I was a potty training, tricycle riding 2 year old. What do we have in common? Nothing. Everything. And yet, the three of us could sit around the dinner table and laugh and immediately get to the deepest levels of conversation. We could get down to the issues that really matter in life. I have learned that when you open yourself up to meeting people that are quite different from yourself you come to find that you are not really that different after all. All it takes is a willingness to step outside your comfort zone and get to know someone new. Life with our Tow-Mater friend was great. As our friends and family got to meet Mr. Richard they were always shocked to learn about his past. You would have no idea that he had completed nearly 30 years in prison. He was so patient and so kind and considerate. He was always one step ahead of you- anticipating your needs. And our kids loved him. They would often run to him as he walked through the door, nearly tackling him as they greeted him in for dinner. During his time with us he fixed our bathroom sink, fixed a door knob, fixed a leaky pipe, installed a light fixture, installed our dishwasher (see “Confessions of a Dishwasher”), helped drain our flooded crawl space (see “When your House Floats Away”), created a brick pathway to our driveway, and helped to landscape our backyard (see “Tilling the Earth”). He did all of this as well as other things that I am sure I am forgetting. “He did 30 years in prison for murder and he has nowhere to go. I think he should come stay with us,” the compassion in my husband, Emmanuel’s voice was dripping through my cell phone and into my ears where his words hung suspended in the air. “Murder?” I couldn’t get passed that word. Emmanuel was filling me in on the details of Richard’s case meanwhile my mind was buzzing and fuzzy with images from one of my favorite stories of all time, Les Miserables. It is a story of redemption for an ex-convict named Jean Valjean who devoted his life to serving God after repenting from a lifetime of crime. I love that story. It gets me every time. 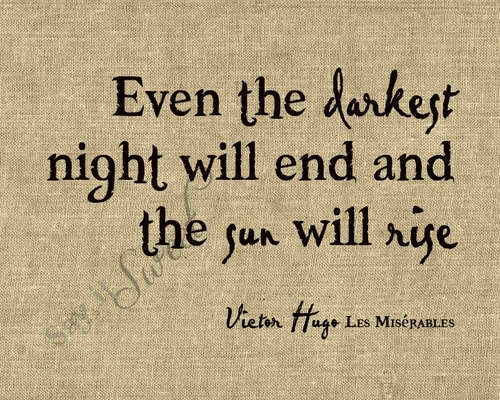 But here I was in reality with Jean Valjean knocking at my doorstep and I was too afraid of the what ifs ringing in my ears to shine a ray of hope on a man who so desperately needed it. “OK. Yes,” My own words echoing with finality like a gavel announcing the fate of a defendant. That’s all it took to get me down on my knees in fervent and frenzied prayer. It’s amazing how easy it is to pray when you are faced with such an illogical risk like bringing an ex-convict into the same home in which you potty train your children. If only I prayed with such vigor on an hourly basis. The people pleaser in me began fretting over what all our friends and family would think. How could you have a complete stranger sleep under the same roof as your children? Aren’t you concerned about what could happen? What if he robs you blind in the middle of the night? Since his release from prison, Mr. Richard had been crashing on the couch of an acquaintance and persistently looking for a job but to no avail. After about 6 months or so he found himself in a rut. It was time for him to move on from his temporary place of residence but he had nowhere to go, no job, no friends or family in the area of his parole and no possessions to his name. His search for a job had proven near impossible over the past 6 months as he carried the burden of his crime with every application that he filled out. He had tried every church and shelter in the area. They helped in the ways that they could but no one was able to put him up for an undetermined amount of time so that Richard could get his feet on the ground. He was at the end of his resources. His family and fiancé were waiting for him in Arkansas but his parole nailed him down in Texas until he could be released to transfer his parole to Arkansas. This is where his entrance into our lives began: homeless, wanting to do what’s right but feeling down on his luck and dragging his feet through the town with no place to go. Richard sat with his head in his hands on a park bench that lined a nearby walking path with nothing more than his bicycle, $35 in his pocket and feelings of defeat. Richard had nothing else to do but pray. At this time an acquaintance of ours spotted Mr. Richard and out of the goodness of her heart offered to help Mr. Richard. How many people do that these days? How many people see a stranger on the side of the road and pull over to offer a helping hand? Not many. But this compassionate woman set aside her own fears and what ifs and did just that. She and her husband referred Mr. Richard to my husband Emmanuel who, after meeting Mr. Richard and hearing his story was ready to say yes. He just needed for me to approve. Thus the phone call while I was supervising the children play at the park. We had opened the doors of our house to people before. Some had a stained past and some did not but we had never had anyone come live with us who had committed murder. Not gonna lie- I was scared. Even after Mr. Richard shared his testimony with me and I believed him, I was still nervous. Who wouldn’t be? After all I am a woman, a mother of two small children, a wife. This character is usually the one most vulnerable to horror and despair in suspenseful movies and books. But, as I prayed, there was this gentle flame burning within me- guiding me towards the unknown. As the flame flickered, the smoke whispered to have faith and trust that God is good and that God is in control. The usual scriptures came to mind, “God has plans to give me hope and a future….” “If my God is for me whom then shall I fear…” “Fear not….” “For such a time like this…” etc. etc. And, I trusted my husband of course. The man had always led me to greener pastures. Emmanuel was always right when it came to things like this. Recently, Richard admitted to me that what stood out to him the most in this whole situation was that I trusted my husband to take the lead in this pivotal decision. He saw it as a testimony of the strength of our marriage. While I accepted the compliment, I did not view the situation that way. I saw it more as a conversation between myself and my God. I had been praying for months for God to show me how to be a servant and here was the perfect opportunity. I saw this as a lesson in faith and dependence on the grace of God. Mr. Richard walked through the door and Emmanuel introduced us, the kids nipping at my heels. I smiled and shook his hand. Richard promised me that he would do whatever was asked of him and thanked me profusely. Meanwhile, I was praying like crazy. Praying. Praying. And then more praying. I got Mr. Richard towels. Prayer. I showed him around the house. Prayer. I introduced him to the kids. Prayer. I ushered the kids off to bed and braced myself for a sleepless night. I had no idea what was coming around the corner. Sleeping in my downstairs family room amidst legos and yoga mats and the laundry was an older, Arkansas parolee who had shot a man. This would either be the beginning of a heart- warming and triumphant story a la Les Miserables or it would turn out to be something else. Spoiler alert- it’s the former. But the story is not in the destination; it is in the journey. I hope that you will come back and accompany Mr. Richard on his journey. Having been one of his companions on this crazy ride, I can tell you that you won’t want to miss it. Stay tuned. Ferguson. Immigration reform. Racial unrest. The country has been restless and angry and hurt. And so have I.
I am restless because there is not really a name for the confusion that I feel when it comes to these things. There is no way to pinpoint the awkwardness that comes from being a minority in a land of majorities. I wrestle and grieve like everyone else, no matter what side you take. I look at my house and sometimes feel worse. Built circa 1896 in north Texas, I can take my guesses as to the muscle that labored this house into fruition. Perhaps my suspicions are wrong. For some reason I do believe that the original owners of this home were good, honest, and kind people. Lets call it my gut instinct. Despite my hopeful gut, I have to be realistic when it comes to the circumstances that surrounded this corner of Texas all those decades ago. Race was an issue then. Race is an issue now. 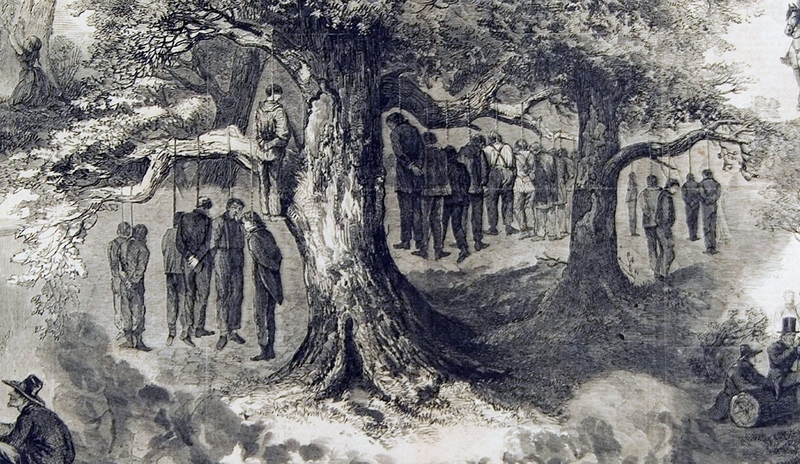 We live not even two blocks from a historical monument that marks the place were 41 men were hanged (allegedly the largest hanging in US history) for treason during the Civil War. They were accused of being unionists and were denied a fair trial. I pass that monument nearly every day. It turns my stomach into knots. Not because I am angry at the people who hanged them; no- we must forgive them. The monument puts me in an uneasy state because it reminds me of the cost and the struggle of millions who came before me all so that I could be a college educated, Mexican-American woman who owns property. The responsibility to live a life that is honorable to their sacrifice is heavy. Many days, I walk through the halls of this house studying the intricacies of the crown moldings and the stairwell banisters and the artistry of the stained glass windows and I wonder who the original owners were. 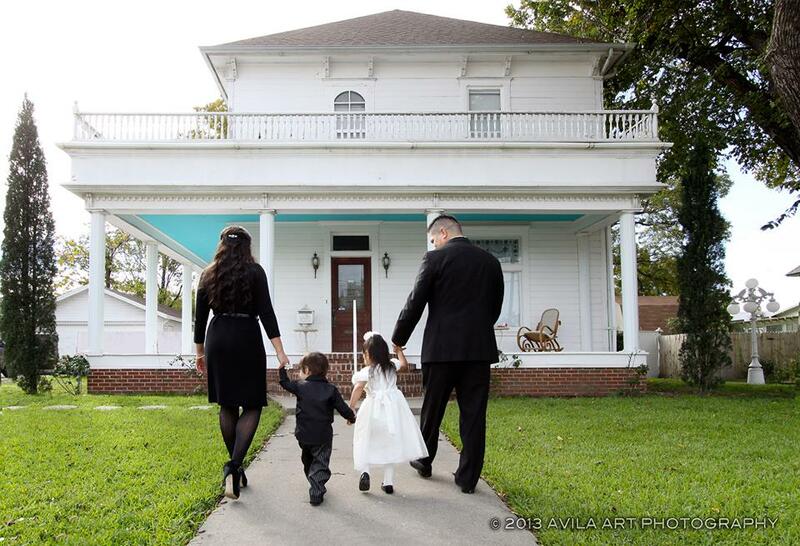 What would they think of a Mexican-American couple buying their house over a hundred years later? Like I said, for some reason I think they were humble and open-minded people. Something in the way these walls were built whisper of a family who were content to be considerate of their fellow man. Even still, would they be surprised to see my darkish skin? Surprised is exactly the word that describes the faces of people when they find out who owns this big, white house. Its like they are expecting some older white couple to live here because, lets be honest, that is usually the population of people who own houses like ours. We stand out. Yes, we stand out and it often feels like we stand alone. But, that is not necessarily a bad thing. I like to think that we are pioneers in a corner of the world that is still growing and grappling with these issues. I grew up in a city in which everyone looked like me. I never gave much thought to being a “minority.” It wasn’t until I moved to Minnesota in my early adulthood that I really began to feel the gravity of the race issue that veils our country. I guess, you don’t really know what it is like to be a minority until you actually are one. I know that sounds obvious but, surprisingly, most people who are in the majority are not familiar with this concept or maybe they are but they have never experienced what that feels like. I know I used to be one of those people. Had we bought a house in a cute little subdivision, I don’t think I would be thinking about these kinds of issues so frequently. This house forces me to weigh in on the heavy issues of race and class because I have become part of the history of this house. This house has seen the suffrage movement, World Wars I and II, the end to segregation, the feminist movement, MTV, the first African American president, etc. 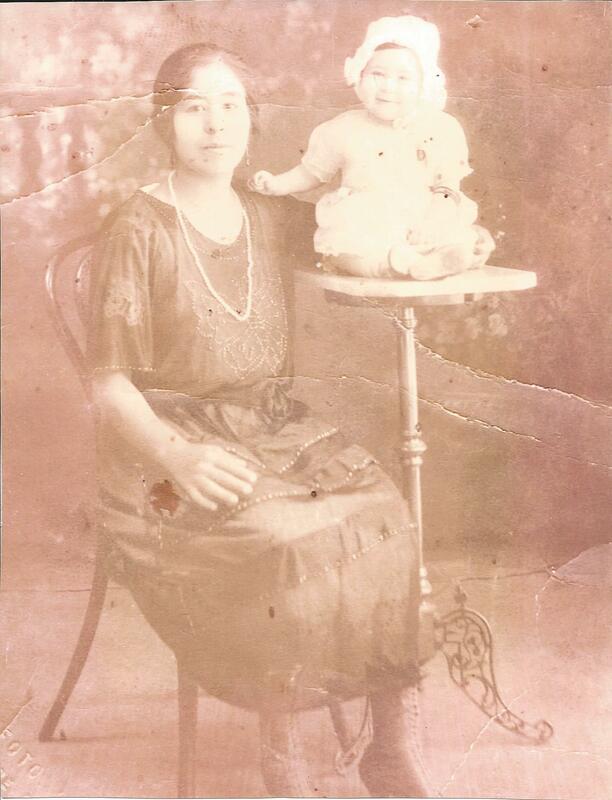 Bottom Line – the chances of a Mexican-American couple owning a house like mine in 1896 were pretty slim, if not impossible. America has come a long, long way and I am proud of her for that. I am thankful that I do not have to live my life under a constant barrage of threats due to the color of my skin. I am thankful that I don’t really have a lot of stories revolving around hate. My experience has been blessed by people of all different “colors” who are content to being kind and decent human beings. For the most part, the people I have met throughout my lifetime know that it is wrong to judge a book by its cover. There is a room in this house that I assume must have belonged to “the help” back when the originals moved into this house. The crown moldings are distinctively plain with no ornate detailing whatsoever. The floor in that room seems to be in the worst shape and it is the room that is adjacent to what would have been the washroom/kitchen area back then. From my very basic knowledge of history and how families operated circa 1896 I can deduce that the originals must have had hired help (aka live in nanny or cook or maid or farm hand or all of the above). Now it is our family room in which my kids run around barefoot and hang hand made ornaments on our Christmas tree and where they are always expected to clean up after themselves because we are not living in 1896. I tend to feel anxious when I think about the “maid’s” room in my house, and the monument of The Great Hanging, and that this house might have been built by men who were in seriously unfortunate circumstances. They are the ghosts of Christmases past that remind me and inform me of how much things have changed for a woman like me. They make it real. Perhaps this house was actually built by very well paid men who never felt discriminated against. That may very well have been the case. But I’m willing to bet that somewhere else in America in 1896, a house was being built by men who were degraded and downtrodden. That is the reality of those painful times and my heart aches for them. Because I am reminded of that every day, I feel a great responsibility to live a life unbound and purposeful. I don’t really know what that will look like for me but I remain the ever hopeful optimist on the hunt for my way of honoring the blood, sweat, and tears of all the pioneers who have proceeded before me. I googled “Mexican Suffragettes” and this was one of many images that came up- Soldadas from the Mexican Revolution. Brave pioneers in my people’s history.